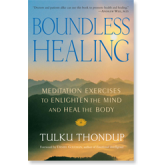 A common meditation long prescribed as part of monastic training in Tibet focuses on the impermanence of the body. Sometimes monks would actually meditate in a cemetery, the better for the mind to understand how ultimately unreliable and subject to decay the body is. The focus here is simply for you to become more accepting of your body as it is. In the West, the body tends to be worshiped unrealistically. Even ‘‘perfect’’ supermodels seem to worry that their bodies should be better than they are, ever more perfect, and never changing. In the East, the body tends to be viewed more as something filthy and unworthy. Asians are not friends with their bodies, either. In both East and West, so much negative energy is attached to the body, and negative perception blocks the healing of body and mind. It’s better to take a more balanced view.